Over the last 10 years, hundreds of studies have been done on the problem of whiplash, and most of those studies have focused on the most common symptom of the diagnosis: neck pain. This concentration of research has resulted in a clear understanding of how a rear-end collision can result in injury. part of the spine moves in a different direction. of the soft tissues that hold the spine together. The primary reason why rear-end collisions cause injury is that the human spine is designed to withstand vertical forces, while a rear-end collision is a horizontal force. The vertical forces are known as “axial” forces. The horizontal forces, known as “shear” forces, cause unnatural movements of the cervical spine and can result in damage to the ligaments of the neck. A new study has now shown that a similar injury mechanism occurs in the lumbar spine as well. Inspired by the research on the cervical spine, the authors of this study applied the same methodology to the low back. They placed a cadaver in a standard automotive seat and placed acceleration-measuring devices in the vertebral bodies of T1, L1, L3, and L5. The seat was placed on a platform that was subjected to rear accelerations of 5g and 8g, or speeds of approximately 8 and 12 mph, respectively. The researchers collected acceleration data at a rate of 10,000 samples per second. Radiographs were taken of the spine before and after the tests. 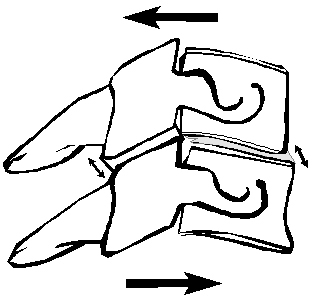 The direction and strength of the forces suggests that the car seat rapidly accelerates into the occupant’s spine, causing the thoracic and lumbar curves to straighten. The 1500 Newtons of force was reached in the 5g test, which was equivalent to an 8 mph collision. So, according to this preliminary study, the car seat back exerts enough force during such a collision to injure the connective tissue of the lumbar spine.